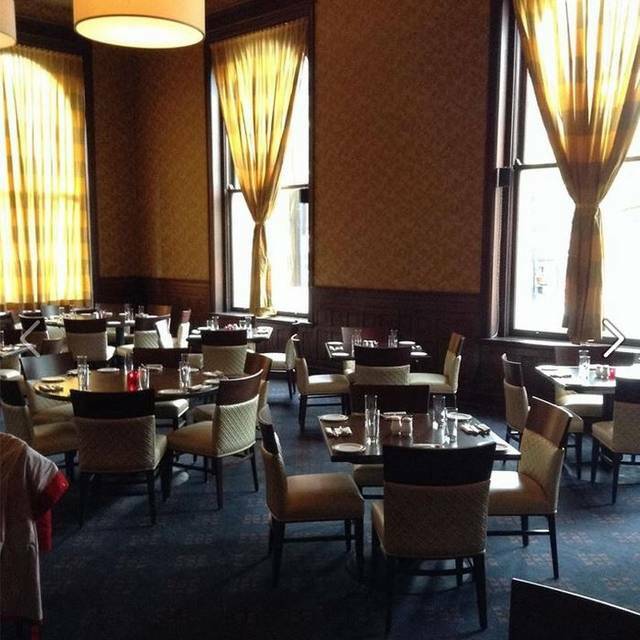 Located on the first floor of The Phoenix, a beautiful and elegant piece of Cincinnati's architectural history, The Presidents Room at The Phoenix is the place where diners experience a mix of classic and new dishes prepared with the finest ingredients available, and where classic drinks are created with modern and unique variations. Dinner: Thursday 5pm-9pm. Friday-Saturday 5pm-10pm. Happy Hour: Thursday-Saturday, 5-7p.m. Delicious prix fix meal for Downtown Cincinnati's restaurant week. Especially loved the small puffy roll. This is a secret great restaurant in Cincinnati. We've eaten here a number of times and have always gotten excellent service along with fabulous food. It is only open for dinner Thursday through Saturday. The menu is seasonal and limited. They move to the summer menu soon. There is a separate bar menu also. Very solid wine list and bartending. Try it, you'll be stunned. The new summer menu has some really good options. The other two couples with us had not experienced the Presidents Room and we most impressed. Beautiful late 19th century Italian Renaissance architecture and first-rate modern American cuisine combined to make the Presidents Room a memorable beginning to theater night. The friendly, helpful service helped cultivate an atmosphere of celebration with a (very good) complimentary Prosecco, and the lovely wooden bar furnished us with excellent cocktails. Both dinner and desert were first-rate. It was also an easy walk to the theater afterward. A hidden gem in the Queen City. I don’t know why this restaurant isn’t packed on a nightly basis. Everyone has been to an event at The Phoenix. The President’s Room is the restaurant on the second floor. Our dinner before Opening Night at the Opera was exquisite. The seasonal menu had something for everyone. The scallops I had were prepared perfectly, and the tuna tartare was equally delicious. The desserts were off the hook. Cookies and milk was 5 Star, if not a little small, but the chocolate torte was worth the trip alone. Servers are attentive and helpful. The dining room is grand and intimate at the same time. Well worth a special trip. Brittany was a great server and asset for the President’s Room. The food was unique and wonderful! The staff made my husband's retirement surprise dinner a huge success. The meal was terrific! Chef treated us to several surprises. It was one of the finest meals we have shared in a very long time and certainly compares to any of the finest restaurants in the city. We were slightly disappointed in the ambiance as there was a wedding party in the bar which made the dining room quite noisy. Otherwise, our experience was just perfect! Our favorite Cincinnati restaurant. Food is fabulous. I had the Tonarelli, my wife the duck. Both were great. My wife loves the potato leek sauce that comes with the duck. Inventive classic cocktails are always fun and half-price bottles of wine on Thursdays is quite a bargain. Service is exemplary. Stephan did another wonderful job. We especially appreciate all the little extras - complimentary sparkling wine, amuse bouchés, and chocolates to finish. The food is very creative and quite good, but he menu is very limited (4 first course options and 4 or 5 entrees, 2 desserts). Not impressed with the wine list and the supposed lemon drop Martini was just a vodka martini with a twist of lemon. The decor was once elegant but is now very tired. The servers were very pleasant and accommodating. Very good food was served with pride. Very expensive though. One of the best dining options anywhere. The food is outstanding and the service second to none. With little touches such as a welcome cava, an amuse bouche and then a chocolate at the end of the meal, it can not be beaten. And then, Thurs evening was 1/2 price wine !! It is a must dining spot. The food was epically good, but the live music and the wedding party made the room loud and wayfinding difficult. Lastly, the exit was mobbed by smokers (I’m assuming from the wedding party) that made the final impressions a bit unpleasant. My friend and I were there for pre-theater dinner which was during restaurant week. Food was excellent and service started out great but then not as good by the end of our meal. We told reservations personnel and then wait staff we had theater tickets. We had to hurry to finish our desserts to get out in time for the theater. Positives about the restaurant is that they provide free parking in the Garfield garage. Handicapped accessible by elevator. Negatives are that the restaurant and facility itself need updating. Love the space, but missing tablecloths. Our table had lots of dinks, which would be fine for a certain vibe, but the rest of the space did not dictate a rustic/vintage vibe. Food was good, but not amazing. Our server was attentive and nice, but not terribly knowledgeable on the wines, cocktails or even some of the elements of the food themselves. 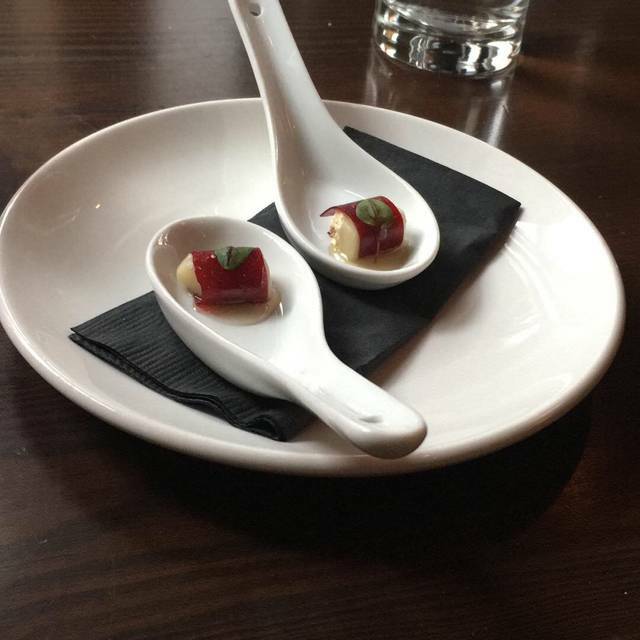 We didn't get new silverware with our tasting courses, but the timing and temperature of the food was well done. 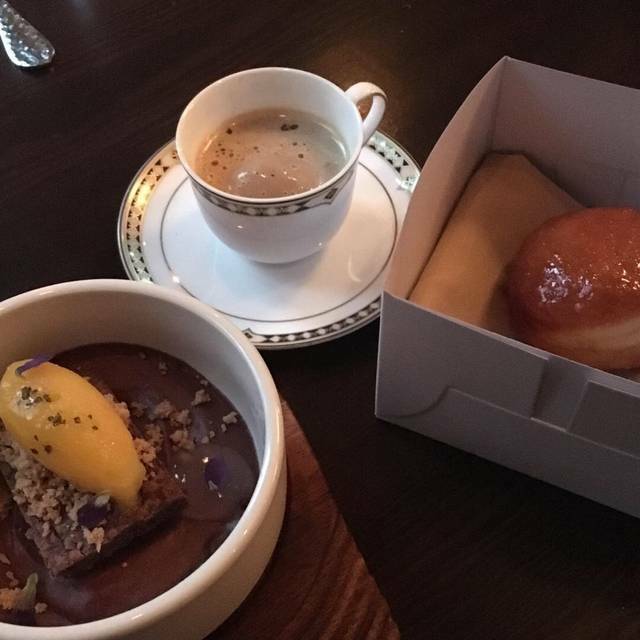 Also, the donuts and Turkish coffee affogato were a nice finish to the menu. Out of 6 wine pairings, one was excellent, one was awful, and the rest were not bad. I would recommend this as a place you could take an older child as a good introduction to a tasting menu without breaking the bank. 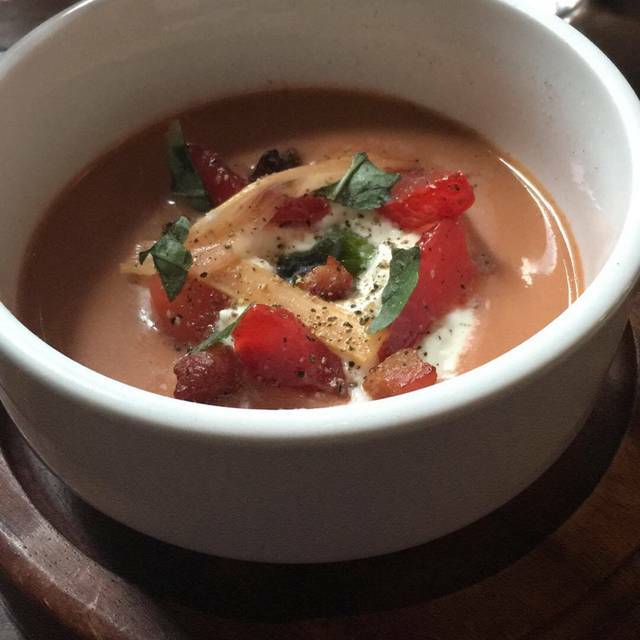 My overall take - I'm glad I tried this restaurant. We had a nice time. But with all of the fine options in this city, nothing in particular stood out enough to make it on the list of places to which I will return. Great service and food for restaurant week. Lot’s of chef extras. Restaurant week in Cincinnati. We chose to go to The President’s Room, our favorite Cincinnati restaurant. Three courses for $35, to kill for. New spring menu. My wife had the little gem salad now with strawberries, her favorite salad and her favorite version. She had the new chicken entree and absolutely loved it. I had the familiar sauerkraut balls and they are delicious. The papperadelle was excellent. Service by Brittany was wonderful as usual. All the staff are amazing. What a pleasant surprise! We went to the President's Room before a play at the Aronoff, and the dinner was amazing! The menu is limited, but everything was delish! Portions were small, but the perfect size for a great meal. We will go there again for sure! I tried to attach photos, but they would not upload. Sea Bass was amazing, as was the Duck. It’s our 3rd time here and every time was wonderful. Beautiful setting. Excellent service. Creative and delicious food. Will definitely come back. This was our first time at The President’s Room but we will be back. Great food in a great space!! This was a very unique find. This is a place you take your best customers of friends. Very exquisite. Located in The Phoenix, the restaurant and bar are only open Thursday through Sunday. The architecture is palatial. The food is stellar and service was astounding. The staff is extremely accommodating and friendly. They're known for a great happy hour where they make craft cocktails and have a nice variety of draft and bottled beer. They had Rhinegeist The Truth on tap. I learned The Phoenix is mostly for banquets and special occasions. 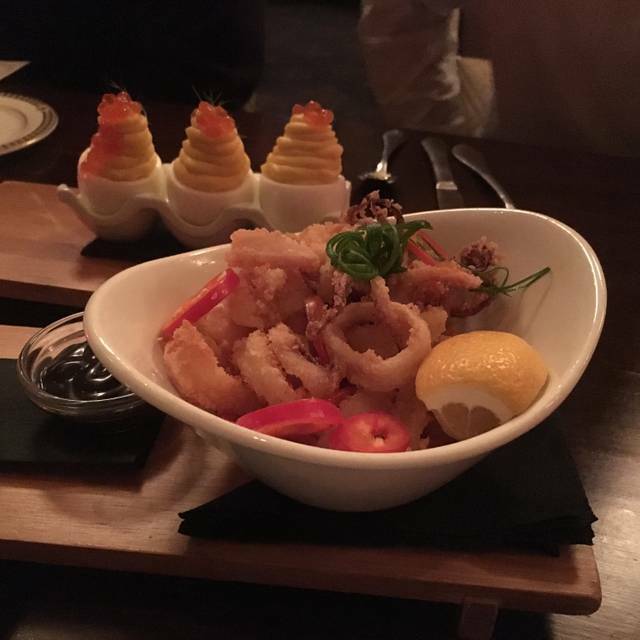 We started out with several appetizers including calamari and deviled eggs with salmon roe. In between meals, our server Steven provided palate cleansing with a champagne with ginger slice. On the second course, we had a rolled scallop. The bread were exceptional. For my main course, I had the full seafood risotto. The also offer a half portion which is still quite big. The risotto had shrimp, mussels and 2 large scallops. A culinary masterpiece. For dessert, we had the s'mores for the table. This included homemade marshmallows with a lemon twist, graham crackers and a stick of fudge. You were then provided small potted burners to toast the marshmallows. For me, this venue gets 6 out of 5 stars. Bravo!! The Foi Gras starter was divine, as were the lovely amuse bouche. And the Daisy cocktail was lovely too! Excellent service, lovely restaurant. Was less than impressed by the foie gras & corned beef special. Outstanding meal, with several complimentary tastes throughout the evening. Wine bottles are half price on Thursdays, so we enjoyed a terrific wine as well; the dinner tab was an incredible value. Great service, too. A surprise gem in downtown Cincinnati! 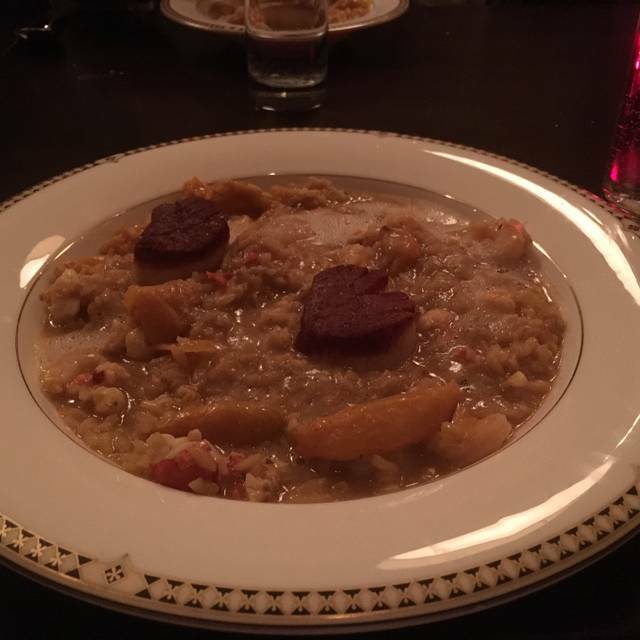 Unique and delicious cuisine served in a beautiful historical room. Enjoyed the complimentary prosecco toast and small bites. Outstanding service by Stephen. It was an exceptional dining experience. We hope to return soon. Delicious food in a beautiful setting. Service is excellent. Extras given are a delight and turn a normal Dinner into a special meal. Prices are very fair. Wine list is decent. 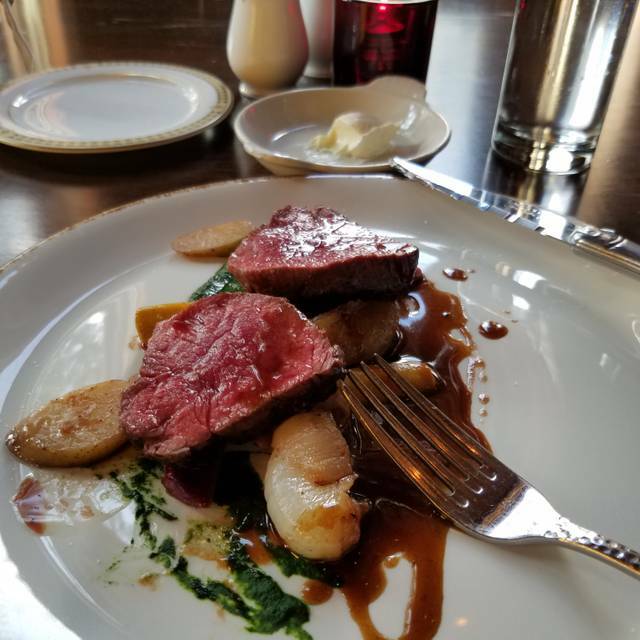 We had one of the best eating experiences we’ve had in a long time at the President’s Room. Our server is legitimately the best server we’ve had in years and made the experience amazing. We highly recommend this place and will certainly return again. This was a great restaurant. Loved the ways dishes were brought out, starting with small complimentary plates at a time then our appetizer and entrees we ordered. They even included a sparkling toast. The menu may be small, but the food they do have is yummy! As always we were not disappointed with President's Room. We celebrated my mother-in-law's birthday with excellend dinner. We had prawn salad, calamari and pappardelle as hors d'oeuvres. Delicious. For entrees we twice the duck which was exquisite and seafood risotto. Red wine was great and our server, Britney whom we already know from previous visits was friendly, professional and knew the menu and wine well. We love this place. Used to be Cincinnati's best keep secret but better call for reservations now. Looking for a lighter bite, try the wonderful high-top tables at the cozy bar with its own menu - perfect! There is an Orange beverage that is amazing. Wonderful experience! Affordable and Romantic. Intimate seating and piano music was wonderful. Very attentive staff and servers. Went for the first time for Valentines Day, already making plans to to back again. The seasonal menu options were delightful and we really enjoyed the extras of tastings delivered to the table. 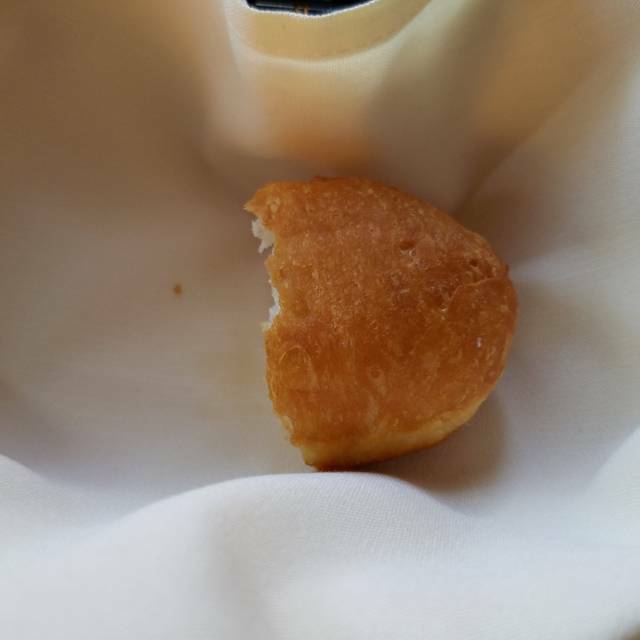 (the freshly cheese cracker bites were great!) Truly a great hidden find in the city!! One of our favorites in Cincinnati. Every time is a great experience. One of the true gems of the Queen City. From the prosecco welcome and live combo playing, to the roaring fire place and live rose on departure it was a memorable Valentines dinner. The food is always wonderful as are their cocktails but the extra touches could not have been better. I took my fiancé here for Valentine's Day. We were beyond impressed with the service that we received. All kinds of complimentary items and a prosecco toast was given to the both of us. The staff was extremely attentive and took very good care of us. The food was amazing and very unique. She was so impressed with the restaurant that she seriously suggested we just go there every year. We will definitely be back! Valentine's day dinner so we had to go to our favorite Cincinnati restaurant! My wife recently suffered a temporary but debilitating injury requiring the use of a wheelchair. The executive chef met us at ground level and escorted us to the elevator entrance on 9th street. Thank you Cat and Jeremy! How great is that? Upon arrival we received the customary sparkling wine. Our cocktails were terrific as usual. My wife tried a new one, the Rose Spritz, and loved it. I had one of my regulars the always excellent Old Fashioned. 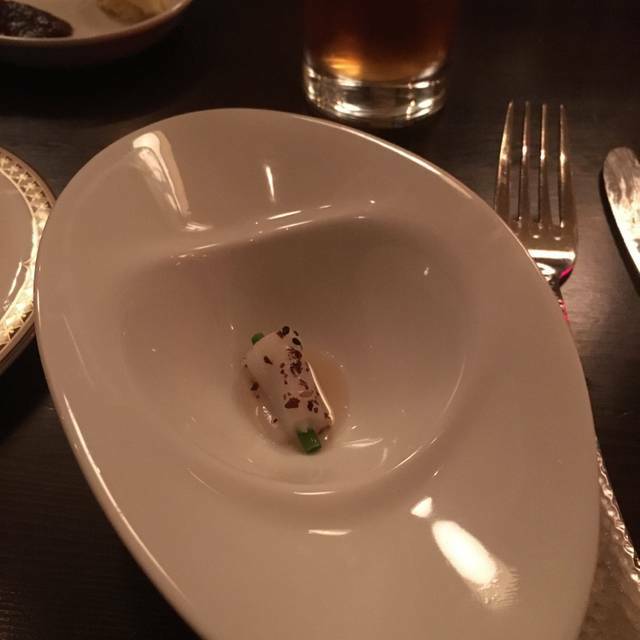 My wife had her usual Little Gem salad. I tried the Foie Gras for the first time. It is very unusual. It is served with raisin bread, a huckleberry sauce, and the chef's version of a fruit roll-up. Both savory and sweet, and delicious. We both had the Agnolotti, it is to kill for. We both also had the Cafe de Italiano after dinner - wonderful. Service was great as always. Brittany did another superb job for us! Add in the amuse bouches, the ending hot chocolate, the warm fire, and the beautiful room and building and you have the perfect evening. We loved dining at the President’s Room. The service was out of this world and the cuisine was creative, delicious and beautifully presented. The mixed drinks are great! They used fresh ingredients and innovative combinations, taking you to a different place for your drinking experience. We will definitely be going back!